Welcome to UMC Physicians! UMC Physicians is a physician practice management group formed by UMC in 1996 to manage the hospital's Community Health Centers and to develop a broad base of primary care patients that would support the hospital and medical school. LakeRidge Medical Center has been in the UMC Physicians family for many years. LakeRidge is located on 82nd Street, just East of Slide road at 5130 82nd Street. In November of last year, LakeRidge shifted from primary care services to accommodate mostly Urgent Care, Occupational Medicine, and Workers’ Compensation patients. Our providers are made up of Dr. Mario Pena, Dr. David Long, Dr. Marissa Yates, and Ms. Jenny Ezell, FNP who are all family practice providers. Mr. Clay Garrison is the Regional Operations Officer and Mr. Bart Sanders is the Practice Administrator. The clinic operating hours are Monday through Friday, 8am to 8pm, Saturdays from 9am to 5pm, and Sundays from 1pm to 5pm. We have fourteen exam rooms, two procedure rooms, with our own X-ray and laboratory services on site. Our lab serves a large patient population setting a company record in June 2015 with over 850 patient specimens collected. Patients are encouraged to walk-in but may also utilize the Wait From Home system along with scheduled appointments for family medicine or Workers’ Compensation. 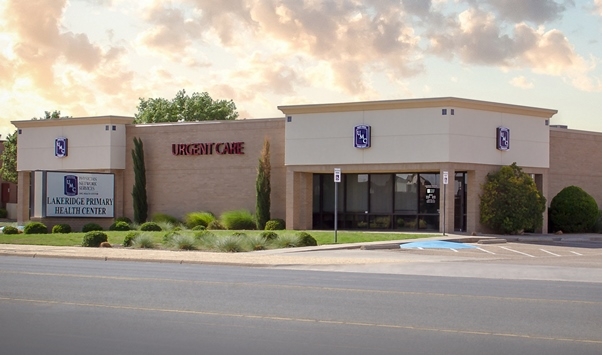 We serve all of University Medical Center’s employees for their pre-employment and random drug and nicotine screening along with Walmart, United Supermarkets, and other local accounts receiving Occupational Medicine Services. We look forward to serving you here at LakeRidge. Please let us know how we can help you. Bart’s medical career began in 1996 as he began work as an EMT at UMC’s Level I Trauma Center and for Lubbock EMS as a 911 emergency dispatcher. He obtained his paramedic license in 1999 and transitioned to the field as a paramedic with Lubbock EMS for seven years serving as president of the honor guard, special operations teams, and as a field training officer. In 2006, he graduated from TTUHSC with a bachelor’s degree in Clinical Services Management. He has since managed long term care facilities, served as an instructor and program director at South Plains College EMS Program, and worked part-time weekly as a field paramedic for Wolfforth EMS since 2006. His most recent posting before coming to UMC Physicians was with the Lynn County Hospital District in Tahoka, Texas as the Director of Emergency Services overseeing the EMS service, the hospital ER, and teaching EMS at Tahoka High School. He is currently completing his internship this fall for an advanced practice certificate as a community paramedic. He started with UMC Physicians in October of 2014 and has been at LakeRidge Medical Center since December of last year as the Practice Administrator. Bart has really enjoyed working in an Urgent Care setting with all of the providers and clinic team this past year which is evident in his Direct Management scores in the recent PressGaney Employee Partnership survey.